We at the American Treasure Tour realize that some of our visitors have had a bit of a challenge finding our location in Oaks, Pennsylvania. We know there are not many signs along the road pointing in the right direction - we're working on that. We are in Google Maps, so you should be able to find us with our official street address: 1 American Treasure Way, Oaks, PA. 19456. So, this is what our gorgeous globe looks like - BUT this is not our location. 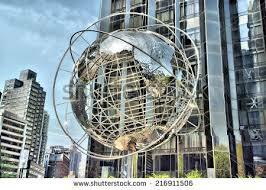 We are not in Columbus Circle, Manhattan, but you will see our replica globe right outside our entrance in Oaks, PA! But if you still need a nudge in the right direction, then we've placed a fantastic new landmark right in front of the building - a shining, magnificent stainless steel globe that stands about fifteen feet tall. You can't miss it, and you don't want to! It will lead you to a world of jaw-dropping goodness. And you can come for General Admission hours - Thursdays, Fridays and Saturdays from 10:00am to 3:00pm (last ticket sales at 2:15pm). You'll be glad you did, and so will we! The blog is back, baby!